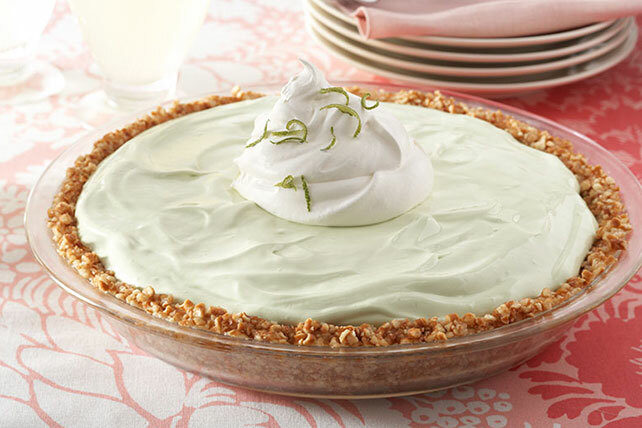 Enjoy our Key Lime Margarita Pie, but don’t worry about alcohol! The pie’s taste is from a salty pretzel crust and citrusy filling. Combine pretzel crumbs, sugar and butter; press onto bottom and up side of 9-inch pie plate. Refrigerate until ready to use. Whisk next 3 ingredients in large bowl until blended. Stir in 2-1/2 cups COOL WHIP; pour into crust. Freeze 6 hours or until firm. Let stand at room temperature 15 min. before serving to soften slightly. Top with remaining COOL WHIP. For more information and nutritional information, CLICK HERE. This entry was posted in Writing Life and tagged characters, food, fun stuff, links, Nightriders MC, recipe, Tuesday Treats. Bookmark the permalink. Ooo, that looks good. Yum!